LastPass makes it easy to have strong passwords with access on all your devices for Free! You're tired of setting, remembering (and forgetting) passwords. That's why we created LastPass, a convenient password manager designed around data privacy. With seamless background sync, offline access, and an app for almost every device — you always have access to your passwords when, and where you need them. Logging in just got a whole lot easier! Once your passwords are stored with LastPass — autofill will save you from typing another password ever again. The built-in password generator provides customized controls so you can create long, randomized passwords. LastPass makes it easy to generate a unique password for each account so you're always protected against hacking. When you're ready to make a purchase, LastPass can help autofill forms; making it easy to complete your payment and go on to the next thing. You'll never need to run and grab your wallet again. Save a password once, and it's instantly available on all your devices. 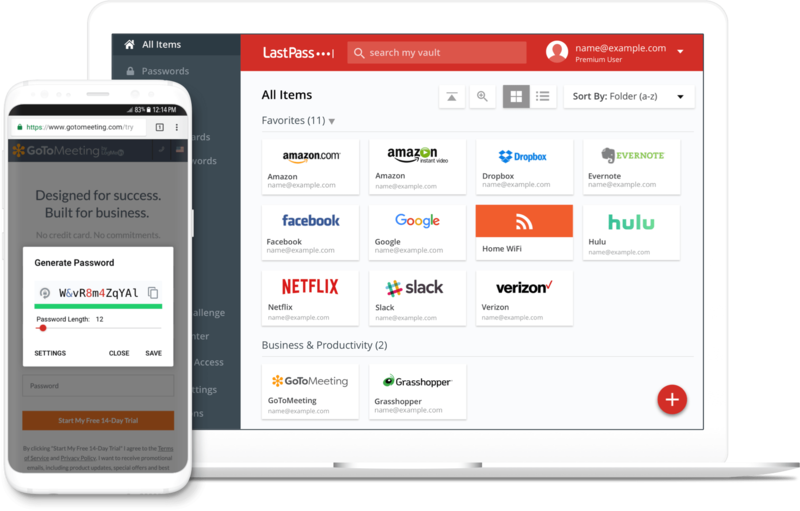 From our highly-rated browser extension to the mobile app, LastPass goes everywhere you do. We've engineered LastPass with an uncompromising degree of security to keep all your information private, secure, and hidden (even from us).